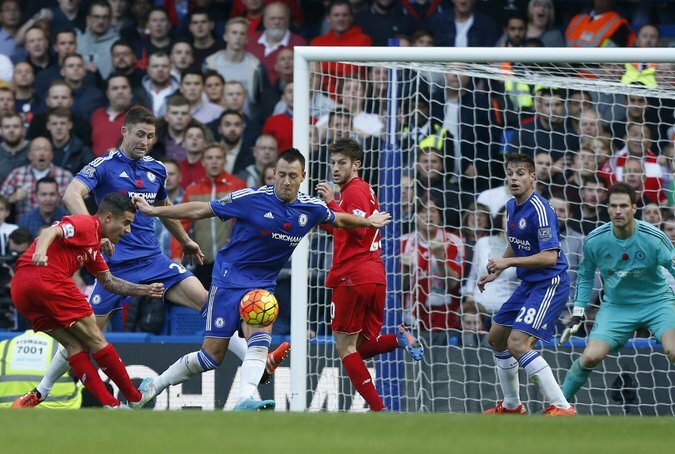 Liverpool midfielder Philippe Coutinho scoring one of his two goals in the team’s 3-1 victory at Chelsea on Saturday. Chelsea’s slump in form under Jose Mourinho reached a new low on Saturday after a 3-1 loss at home to Liverpool, while Arsenal and Manchester City continued to set the pace at the summit of the Premier League. Chelsea took the lead through Ramires after only four minutes, before two goals by Philippe Coutinho and another from Christian Benteke sealed Juergen Klopp’s first league win as Liverpool manager — and Mourinho’s sixth league defeat this season. Arsenal beat visiting Swansea 3-0, while City needed a late penalty by Yaya Toure to beat Norwich, 2-1, at home. Both sides have 25 points, but City is first on goal differential.